Diabetes is a metabolic disease defined by high blood sugar levels, and can affect organs such as the heart, eyes and kidneys. According to the World Health Organization, over 420 million people suffer from this condition worldwide. People with diabetes must monitor their blood glucose levels regularly and frequently, but the existing method is invasive, as it requires taking a blood sample from the patient's fingertip. 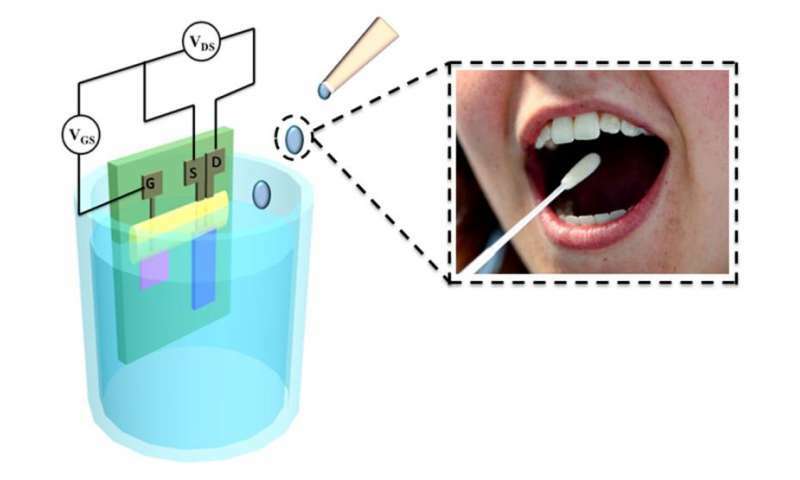 Dr Yan Feng and his research team at The Hong Kong Polytechnic University (PolyU) have developed a highly sensitive, accurate, flexible and affordable biological sensor that can detect glucose levels in saliva. The device is based on an organic electrochemical transistor (OECT), a highly sensitive and easy-to-fabricate platform for biosensors that can convert biological elements such as ions, lactose and glucose into electrical currents. The challenge with OECTs, however, is to create a selective biosensor that is only sensitive to a specific substance, such as glucose, because OECTs can also pick up electrical currents from other biochemicals. What's more, since the amount of glucose in saliva is very small, it is difficult to detect. In order to overcome these issues, the PolyU researchers built the OECT platform using a glucose oxidase enzyme, which is only sensitive to glucose. The team then coated the enzyme with two types of polymer layers to prevent interference from other substances in saliva, thereby increasing both the selectivity and sensitivity of the device. The researchers say the new biosensor is nearly 1,000 times more sensitive than the conventional blood glucose testing method. It is also flexible and has the potential, after further research, to be incorporated into wearable technologies to monitor glucose levels from sweat, the researchers add. Its low manufacturing cost also makes it suitable for mass production. Furthermore, by changing the enzyme, the biosensor could be used to monitor other substances such as uric acid or cholesterol levels, for example. Yan plans to further optimize the current sensor's features, such as its stability and geometrical design, and improve its fabrication technique to be more suitable for commercial mass production. He also wants to develop different types of biological sensors using the same platform.